Pain in the tailbone, or coccyx, is a condition five times more common in men than women but is treatable with stretching, massage, relaxation and pelvic floor exercises. More extreme methods such as steroid injections and surgery may be necessary. Preventing tailbone pain through keeping the muscles surrounding the tailbone flexible is easier than fixing an existing condition. Piriformis stretches can help people with tailbone pain. The piriformis muscle is not a large muscle but its placement near the sacrum on the lower spine and its involvement in several movements of the hip and thighbone create the opportunity for tight piriformis muscles to cause lower back and leg pain. Stretching relieves tight muscle pain and prevents pain as well. To stretch the piriformis, sit with your legs straight and sit up tall. Grab your right leg and hug it to your chest without rounding your back. The right leg bends and the knee points to the right. Do the same for the left leg. Hold each for 30 seconds. The towel lying glute stretch lengthens the gluteus maximus muscle. The gluteus maximus muscle connects to the tailbone. Every time you take a step, the glute pulls on the tailbone. Stretching prevents tight glutes from pulling painfully on the tailbone. To perform the towel lying glute stretch, lie on your back and cross the right leg over the left with the knee pointing outwards. Wrap a towel around the back of your left thigh and pull your legs toward you until the right glute stretches. Repeat on the other side. Hold each side for 30 seconds. The squatting glute stretch also targets the gluteus maximus muscle. This stretch might work better for you than the towel stretch because you move through a wider range of motion, though it does require better balance. To begin, cross your right leg onto your left thigh and grab a hold of a fixed bar on a wall. Then, bend your left knee slightly as you bend forward and move your hips backwards. This squat position stretches the right glute. Switch sides to stretch the left glute. Hold for 30 seconds per side. The seated wide-angle pose is a yoga exercise to stretch that lengthens the inner thighs, hips, lower back and hamstrings. 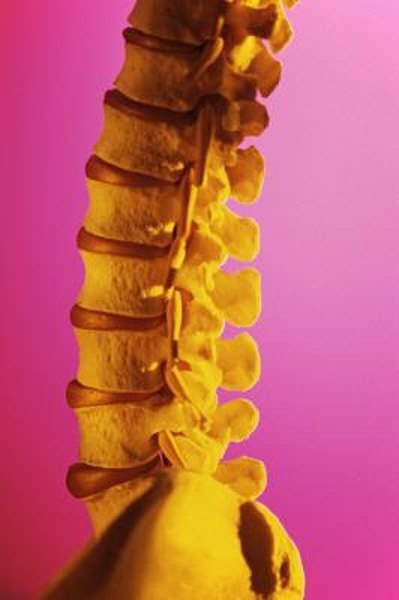 You stretch through the entire length of your spine all the way down to the tailbone. To perform the seated wide-angle pose, sit with your legs open approximately 110 to 120 degrees and your shoulders positioned above your hips. Then, bend forward from the hips and tuck your tailbone down. Work toward getting your chest to the floor. Hold your torso as close as you can for 30 seconds.